Can ALGN stock deliver even more profits? Align Technology, Inc. (NASDAQ:ALGN) stock is up almost 87% over the past 12 months, and nearly 82% year to date. What’s more, it’s a $14 billion company by market cap, so it was a real feat to almost double its value in just a year. So, does it make some awesome cloud-based software, or a chip for the next generation of iPhones, or a cure for cancer? Nope. It makes braces. For your teeth. ALGN is the maker of Invisalign, the next generation in braces. While traditional braces are still necessary for many kids as their mouths are forming, a number of children don’t need significant adjustments for their teeth. Invisalign braces (aka, aligners) are built for them. But, even bigger for this brand is the huge adult market for these “invisible” braces. Some adults didn’t get much orthodontic attention when they were young, but as adults want to have a more attractive smile or simply straighter teeth. There’s another group that had braces or a retainer when they were young but didn’t continue to wear a retainer as they got older and their teeth have shifted. And Invisalign is a great solution. 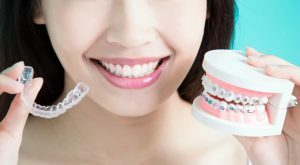 Because they are made of a rigid, clear plastic that are custom built to fit around your teeth, they are more aesthetically pleasing than traditional braces, especially for teens and adults. Patients receive trays of the braces and you wear each pair for a given amount of time, throw them away and use a new set. They’re cheaper than traditional braces and you don’t have to go to the doctor as often for adjustments. In June, ALGN announced plans to open its first plant in China, which has been part of its growth strategy. A new national marketing campaign in the U.S. is also underway to expand the brand. But beyond this story is its Scanner division, which includes its iTero and OrthoCAD services. Instead of taking impressions of your teeth with that clay-like substance (a rather odious and uncomfortable process), iTero scans your teeth and builds a digital or virtual impression of your teeth and mouth. And according to Yahoo! Finance, ALGN has come out with software for its intraoral scanners that allow dentists to build a time lapse view of a patient’s mouth using scans taken over a period of time. And just last week, ALGN announced a new distribution deal with Patterson Companies, Inc. (NASDAQ:PDCO) of which Patterson Dental is a division. Patterson has been around since 1877 and is very well placed throughout the U.S. and Canada. iTero will be a part of Patterson Dental’s CAD/CAM product portfolio in September. That’s a great way to grow its potential market without having to deploy its own resources to do it. So, is there growth left for ALGN stock? Absolutely. Article printed from InvestorPlace Media, https://investorplace.com/2017/09/align-technology-inc-algn-up-more-than-85-still-smiling/.